Centers of South Florida where he became experienced in ocular post-surgical care following cataract, glaucoma and corneal surgeries. He also completed an externship at Easton Eye Care gaining experience fitting a variety of contact lenses and managing pre and post-op LASIK surgical care. During his years at Nova Southeastern University, Dr. Marsden was inducted into the Beta Sigma Kappa Optometric Honours Society—an organization dedicated to academic excellence and professionalism and a privilege given to those who maintain an academic average of 90% or better. Dr. Marsden was consistently placed on the university’s Dean’s List for his outstanding scholastic performance throughout his academic career. He currently practices at Bronte Optometry, Burlington Optometry, and Erin Mills Optometry in Mississauga. 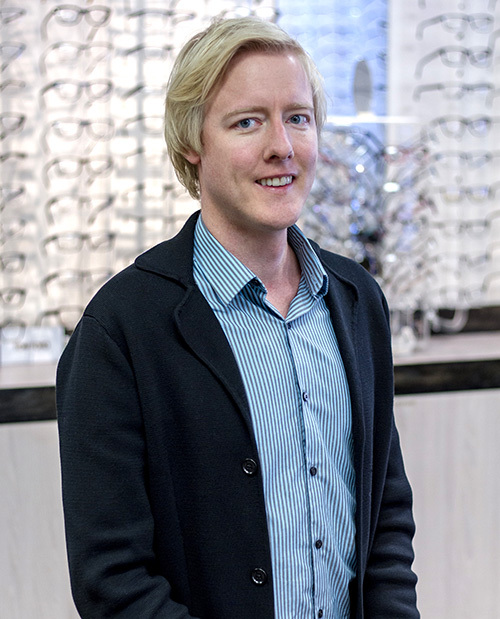 Before his optometric training, Dr. Marsden completed an Honours Bachelor of Science degree at the University of Toronto. In his spare time, Dr. Marsden enjoys snowboarding, tennis, traveling and has volunteered for The Kidney Foundation of Canada for over 20 years. At Bronte Optometry, we offer oculo-visual assessments for all ages. That’s just a fancy way to say that our Oakville Optometrists offer convenient and professional eye-exams. Learn more. Our Oakville location carries hundreds of different glasses and sunglasses to suit your personal style. Drop by our showroom to browse our entire selection today! Now that you’ve gotten to know Dr. Blake Marsden a little better, book a free consultation today.